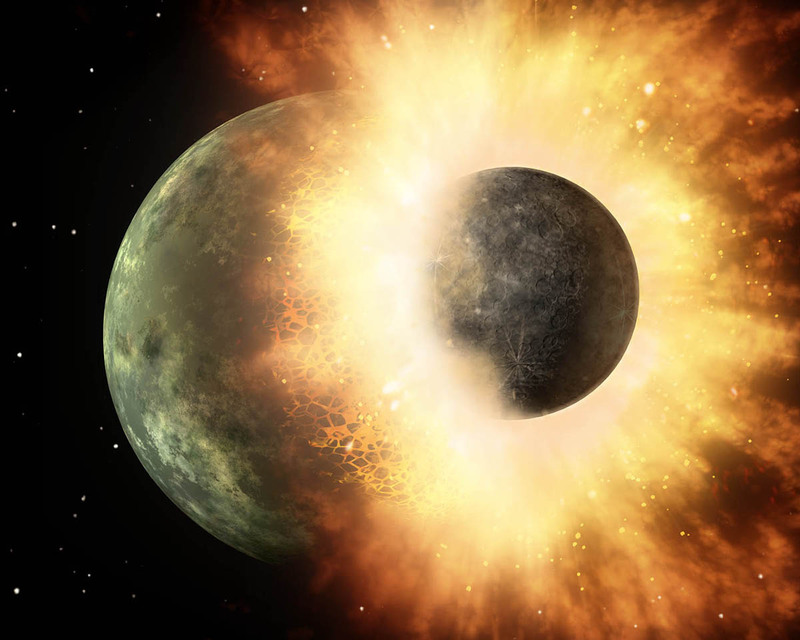 Artist’s rendering of cosmic collision involving two objects whose combined mass was at least twice that of our Moon. Discovered using the Spitzer Space Telescope in the planetary system of a star called HD 172555 100 light-years away. “It’s unusual to catch such a collision in the act, that’s for sure,” said Geoffrey Bryden, an astronomer specializing in extrasolar planet formation at NASA’s Jet Propulsion Laboratory and a member of the science team that made the discovery. When Bryden and his colleagues pointed Spitzer at a star 100 light-years away called HD 172555, they noticed something strange. Patterns in the spectrum of light coming from nearby the star showed distinctive signs of silicon monoxide gas – huge amounts of it – as well as a kind of volcanic rock called tektite. Based on the amount of silicon monoxide and tektites, Bryden’s team calculated that the colliding planetary bodies must have had a combined mass more than twice that of Earth’s moon. The collision probably happened between 1,000 and 100,000 years ago – a blink of an eye in cosmic terms. See Spitzer Space Telescope’s brand new Web site at http://spitzer.caltech.edu/. Kids can learn about infrared light and see beautiful Spitzer images by playing the new Spitzer Concentration game at http://spaceplace.jpl.nasa.gov/en/kids/spitzer/concentration.